Casita #1. In town studio, next to Main St. Outdoor Sauna. Casa Moab is centrally located on a quiet street just one block from main. This contemporary designed 5 Casita property reflects the Moab charm and character and is within walking distance to local restaurants and shops. The Moab Brewery, Chile Pepper bike shop, and Slickrock Cinemas are only a short 5-minute walk away. Casita #1 (ground floor, one of five Casitas). features an open airy floor plan, both inviting and comfortable. 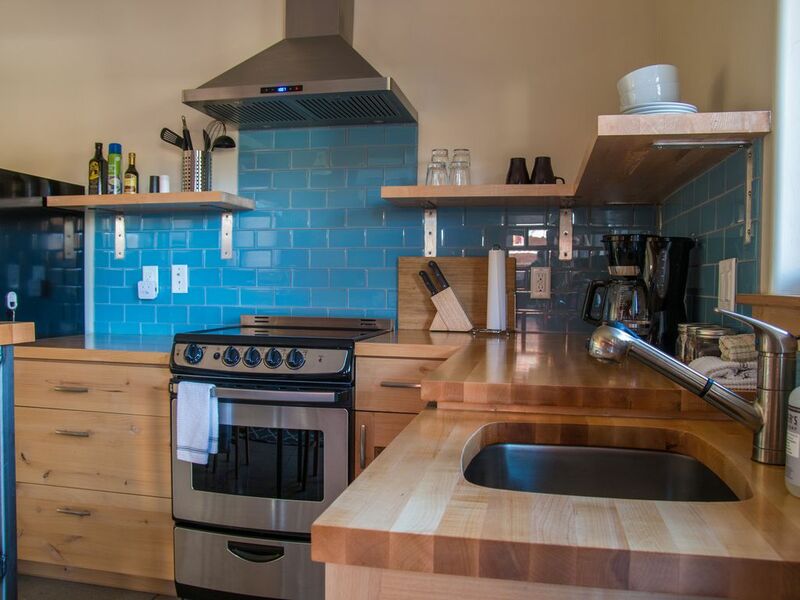 Featuring a plush queen bed, a fully stocked modern kitchen that includes a fridge, stove, microwave, toaster, and coffee maker will make your meal preparation easy between adventures. The open living area/kitchen has a bar-height island with three stools and a 48'' flat screen smart TV, offering cable and WiFi. In addition, there is a comfy couch, stylish accent chair, and locally hewn end tables. The bathroom offers a large, beautifully tiled walk-in shower with endless hot water. And don't worry, your Casita is equipped with easy connectivity for all your electronic devices. Additional amenities include Fresh Coffee, Organic green/black tea, Olive oil. Modern decor, High ceilings, and premium bedding. Outside amenities include Cedar Sauna. Gas fire table. Large private deck including a table and lounge chairs. Open air deluxe BBQ area to relax among friends with plenty of seating alongside native vegetation. Secure enclosed bike storage. * Slickrock Cinema next door. * 6 Miles to Arches National Park. * 4 Miles to Slickrock bike trail. * 0.4 Miles to Pipe dream trail. * 5 Minute walk to Moab Brewery, Chile Pepper bike shop, and Village market. I moved to Moab in 1999 to become a river guide. From day one I noticed a genuine outdoor community that I am proud to be a part of. As well as taking care of Casa Moab I love being outside river guiding, hiking, trail running, and SUPing. I also have been fortunate enough to travel far and wide around the globe, staying in unique lodgings along the way. I have carefully designed and handcrafted Casa Moab for a truly special lodging experience. Stop by and take a look, you won't be disappointed. I built this property from scratch. This project is 3 years in the making, carefully designed and planned every step of the way. Centrally located, quiet and very private yet one block from the main street. Large open bathroom, with beautifully tiled walk-in shower. Casa Moab is a close walk to everything the town has to offer. 5 Parking spaces on site. Additional shaded on street​ parking also available. Tasteful floating Kitchen island with stools seating 2. Taylor was super helpful and around to assist! Best location I could imagine - right off the main drag but also with a trail (Pipe Dream) in the back yard. A perfect stay for my wife and me. We really enjoyed our stay. Such a cute place and kept very clean! It had everything we needed for a weekend for 2 in Moab. Great location also. This place is beautiful outside and inside! The location is perfect for adventuring all over the area. Easy access to wherever you need to go. Super comfortable bed and cozy living area. Great water pressure for those long hot showers after playing all day. Another bonus was locked bike storage. Owner Taylor is on site if needed as well. We’ll be back! Perfect for all that's in and around Moab. The unit was very well laid out and comfortable. Easy walking distance to downtown. Very quick access to Arches and Canyonlands. Taylor was very helpful with recommendations for local dining and activities. Would definately recommend. We stayed for three nights in October. The unit is beautifully designed and has all the amenities one could want. The location is one block from a main street, so it gives you a great combination of quietness at the unit, and convenience to restaurants and shops in town (a 5-minute walk to the brewpub!). We would definitely stay there again. Casa Moab is Located in town, walking distance to the Moab brewery, Slick Rock Cinemas, Chile Pepper Bike Shop. Perfect location, just 1 block from Main Street!